Be sure you are signed into your Google account. Next, open your browser and go to “drive.google.com/templates”. You’ll find a menu in the left side of the website. 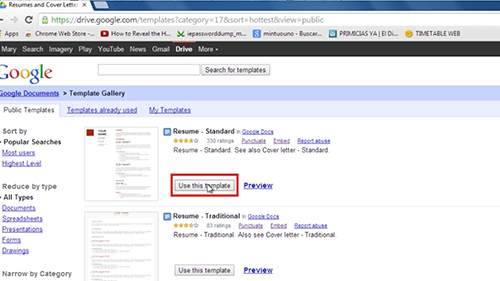 Go to “All categories” and choose “Resume and cover letters”. 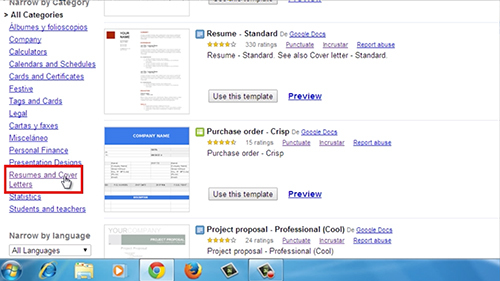 You’ll see all of the available resume templates, and you can preview them to find the one that works best for you. Click “Use this Template” to open it up in a fresh document, and start replacing the placeholder text with your own work experience, name, accomplishments, and so on. 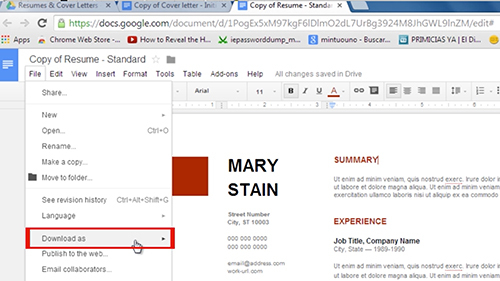 You can also create a cover letter following the same steps. When you’re finished, you can download your resume. Just go to “File”, “Download as”, and choose the format you prefer, or just let it autosave until you need to send it out.